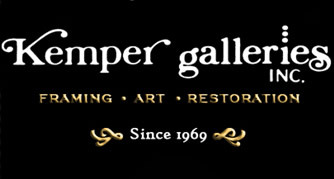 Art Gallery in United States - Kemper Galleries Inc.
Art Galleries of The World > United States Art Galleries > K > Kemper Galleries Inc.
We provide the cheapest, highest quality & fastest custom framing in the state. Our gallery features all types of artwork for any budget. With over 12,000 square feet, you are bound to find something you love! Bev Doolittle, Maija, Nancy Glazier, Peter Ellenshaw, Stephen Lyman, Michel Keck, Katherine McNeill, Manaz, G. Harvey, Bonnie Marris, Judy Larson, Howard Behrens, Lee Bogle, & More!